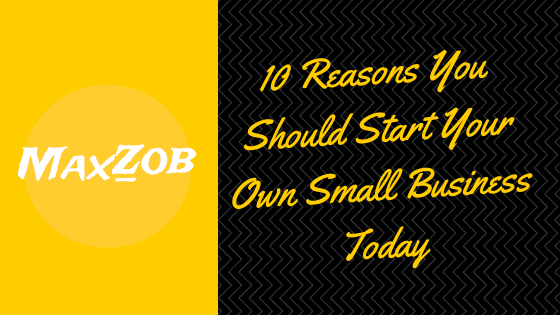 The idea behind starting your own business is the high of being your own boss. Well, this might be a very narrow way of looking at it. Starting something of your own, as a thought is very progressive in itself. It is the time when you finally begin to think for yourself, decide to follow your passion without getting bogged down by the fear of failure. Are you aware that starting your own business comes with a unique set of challenges and thrills? If you’re prepared to face these challenges, now is the time you discover what your interests are and make a living out of it. For all of you, who believe business in their blood and they can do it, this is the right time for you to get at it. Initiate independent thinking– This shift from a regular 9 to 5 job, or college to starting your own small business is going to be highly liberating. It will make you think independently with no external forces to rely on. You will have to trust your own instincts and take your decisions quickly and firmly. Learn to grab opportunities– Any opportunity relating to unserved market needs or a new innovation would require being evaluated in terms of its value addition to your business. You will learn the subtle art of finding your benefit in every situation by not letting go of opportunities that can prove as an advantage for you. Growth in Income Potential– Working for a company limits the income to a salary structure and your growth will always be measured within the boundary of that salary structure. Starting your own business gives you the motivation to work hard as there is an opportunity to grow your income based on your own efforts and hard work. You cannot deny that money is the greatest motivator and when the sky seems to be the limit, then you are bound to give in more than just your 100%. Foster Growth in Learning Curve– Starting a business of your own requires you to take care of the various departments that put the business together. Some departments that you know of and some that you don’t, but along the way, you will acquire new skills and learn new things. The Art of Delegation– Most people working under a boss are heard saying, “his work is to only allot tasks”. Allotting tasks and following them up might not be as easy as it sounds. It is an art to discover people’s talent, keep them motivated and give them work that they will perform accurately. You will learn this art once you start recruiting people under you to work for you. Work-Life Balance– As the ball is in your court now, you are free to decide your priorities, know where you have to be when, and also make time for all that is important to you. A 10 to 7 job sometimes takes a toll on your personal life for health. Start your business today and lead your life on own conditions and find the right work-life balance. Follow your heart– You have the liberty of doing what you enjoy by starting your own business. Each day will no more be a struggle to office and back. Your motivation to work, achieve new heights will be much higher and so will you be content. Happiness truly is doing what you love for a living. Keep innovating– The success of any business, big or small, depends on its idea. If you have an idea that you think can earn you hefty bucks, then it’s time you start your own business. Starting with a great idea, businesses these days are all about innovation. Innovation to stay in the market, innovation to beat competition and innovation to win accolades. Job Security– Working under the constant pressure of impressing your boss or achieving targets can be very tiring. Jobs put you under so much pressure to excel and still be scared for nothing to go wrong. If you’re confident you are worth much more and can achieve all that you set out for, then business is for you. Working as per your own will, doing what makes you happy, taking a break when it all seems too much are all perks of working for yourself. Rewards and Recognition– The happiness of a promotion is extremely special, but recognition for your work, the business that has been set by you from scratch is incomparable. Setting up examples, motivating young adults around you to dream and work hard to achieve their dreams are all perks of doing something by yourself and for yourself. Nothing compares to the feeling of being idealized by people around and that is the motivation that makes you going every single day. It’s the right time for you to think your ideas through. Make a business plan, study the market, and go through the entire process step by step. Set goals for yourself and achieve them one by one, because there isn’t a greater pleasure than the pleasure of working for you. Aman Jha is a digital marketing author, speaker, and consultant. He is a sucker for fine words and blogs about digital marketing and startups.